Pilgrim is designed by Huub and Adelheid Kortekaas. Pilgrims receive the symbol to wear on their bag or jacket and it also serves as a route marker on the way. You might as well call Pilgrim a contemporary ‘patron’! According to the artists, we are on our way to a new world consciousness – a “New Renaissance”. Within this consciousness, humankind no longer sees itself as cut off from nature, but as part of it. All people are connected to each other in the desire to unfold their own unique power to grow and bloom. We are co-creators of reality. An honor ànd a responsibility. 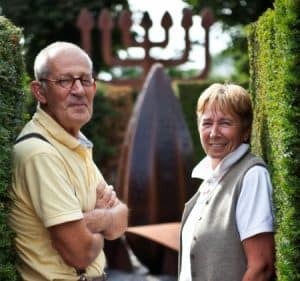 Huub and Adelheid Kortekaas previously made an ‘Angel of Unity‘ for The Garden of Nations in Ramallah (2013). They created this sculpture on behalf of the Dutch embassy, as a gesture of peace for the Palestinian community. In 2008 they also designed the Human Rights Tulip Award for the Dutch Ministry of Foreign Affairs. The prize is awarded annually to someone who has made a valuable contribution to human rights. The symbol Pilgrim refers to the project The Unifying Spiritual Field of the World. In this project the artists sent a golden seedling to inspiring people all over the world, in recognition of their role in a new consciousness rooted in the fundamental connection between human and earth. Huub and Adelheid Kortekaas are currently working on the realisation of the Anima Mundi: a temple that symbolizes the conscience of the earth. Visit the webpage of the artists here.